Whenever you're sitting at your fire pit or fireplace, do you ever think, "Huh. Not enough rocks." Well, not anymore with this river rock kit from Hearth Products Controls. Adding a natural touch your fire ring or pit can now be easy with this assorted bag of stones. This kit contains an assortment of over 84 large (4.5") and small (2.5") stones and is perfect for indoor as well as outdoor use. It is built to withstand exposure to the elements, and the gel-cast ceramic fiber design makes it all lightweight and portable. The combination of brown, gray, and black colored stones is sure to improve any home or outdoor scene. So make sure your fire rocks the boat today! 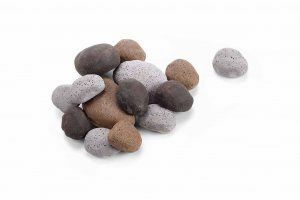 Can these Hearth Products ceramic river rocks be used for an outdoor propane fire pit? They can indeed. The ceramic stones in this kit are both heat and weather resistant. Can these stones be used with a pan burner for fire glass in a fully vented fireplace? Generally, any pan burner that uses fire glass can utilize ceramic stones without an issue, as long as the stones do not directly impinge the flame pattern of the burner. The Multicolor Ceramic Fiber River Rock kit was a great kit with our customer. They look really amazing and natural. ProsThe look of the rocks is very nice and the weight is nice as well.